The pro and anti-Brexit brigades were not the only civilian armies on the warpath this weekend. From West Country beaches to the Yorkshire Dales and Glasgow’s Plantation Park, hundreds of thousands of people of every age (and every political allegiance) were united in their opposition to one thing: litter. As a result, the whole country is feeling a little cleaner and tidier this morning. Great swathes of land and sea have been spared umpteen tons of toxic, non-degradable rubbish as a result. 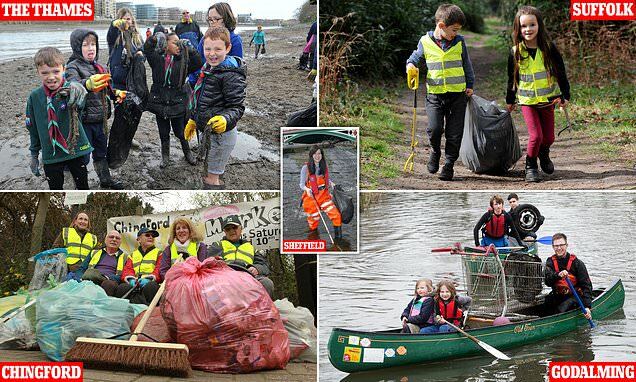 Ask anyone who has taken part in the Great British Spring Clean – organised by Keep Britain Tidy and backed by the Daily Mail – and they will tell you this was anything but a chore. Everyone I met had enjoyed themselves enormously. In some cases, it also presented some interesting challenges too, as I discovered when I joined a particularly intrepid band of young volunteers in Godalming, Surrey. Clearing up rubbish is relatively straightforward when you have a bin bag in one hand and a litter-picker in the other. But what if you need to hold a paddle at the same time? It didn’t bother the members of the Go Godalming Youth Canoe Club as they gathered on the banks of the River Wey in Surrey. Founded by former police officer, Peter Harris, 16 years ago, the club has introduced hundreds of youngsters to the joys of the river. Over the years, some of its members have not only paddled the 20 miles from Godalming to Weybridge, where the Wey joins the Thames, but have then paddled on all the way to London. If you head in the opposite direction, however, Godalming is the end of the line for river traffic on the Wey. Town Bridge is the point beyond which no motorised vessel is allowed to proceed.